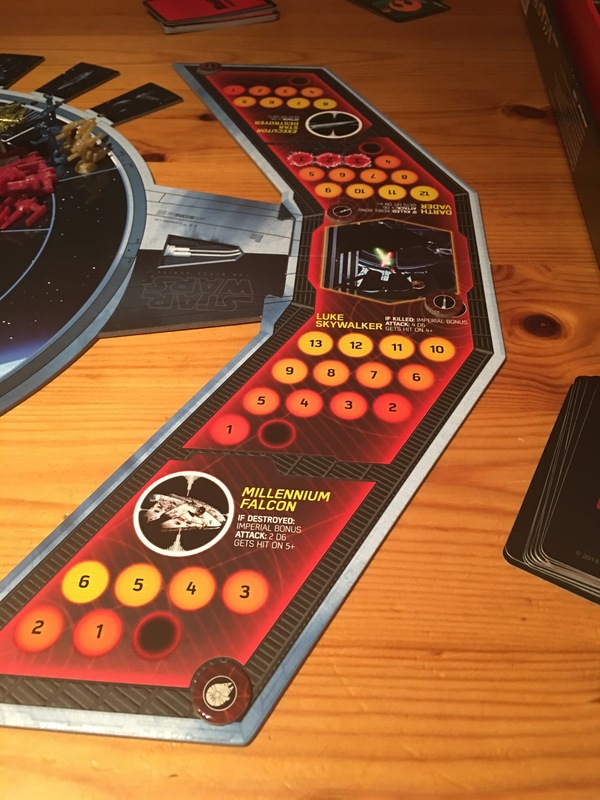 It seems fitting that we played a Star Wars game last Thur since Rogue One hoved into view. I had Star Wars Risk on my “must get that sometime” list (which mostly lists every game I don’t own). The better component quality Black Edition popped up on a price drop post and I struck. It arrived bloody quick too. Sites are on point this xmas. 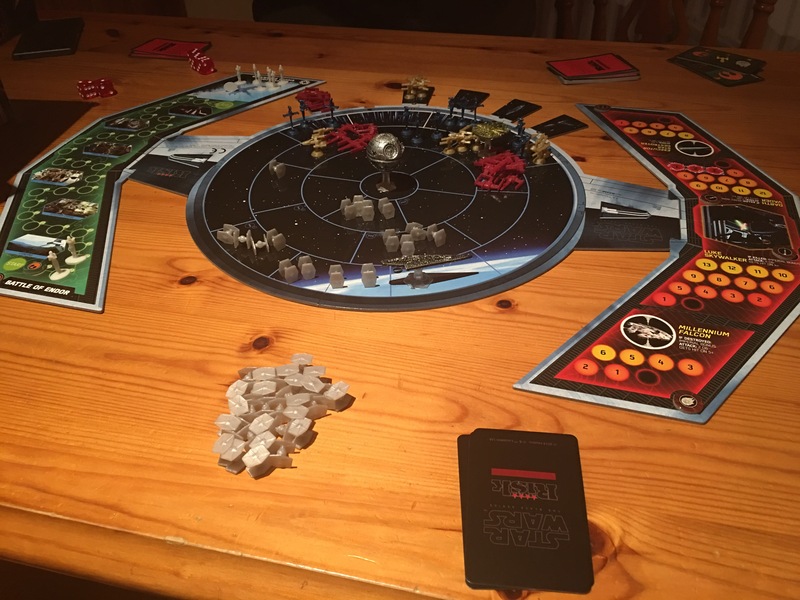 The latest edition of Star Wars Risk is the least Risk like game of any I’ve played. More importantly it’s a FUN game. The game I understand is not a million miles from the hen’s teeth oop Queen’s gambit (although a different setting). The game is set at the end of Return of Jedi and sees three epic events kicking off. 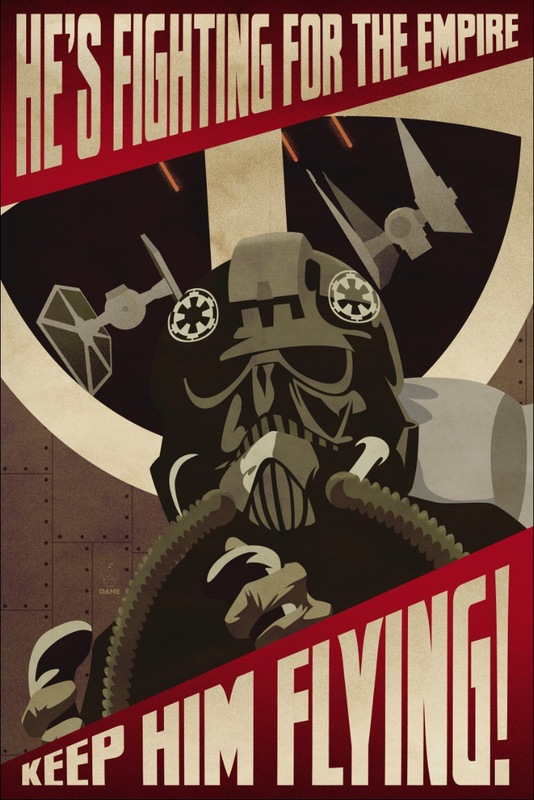 The raid on the shield generator on Endor, the light saber battle between Vader and Luke and the big old space battle around and hopefully in the new DeathStar. 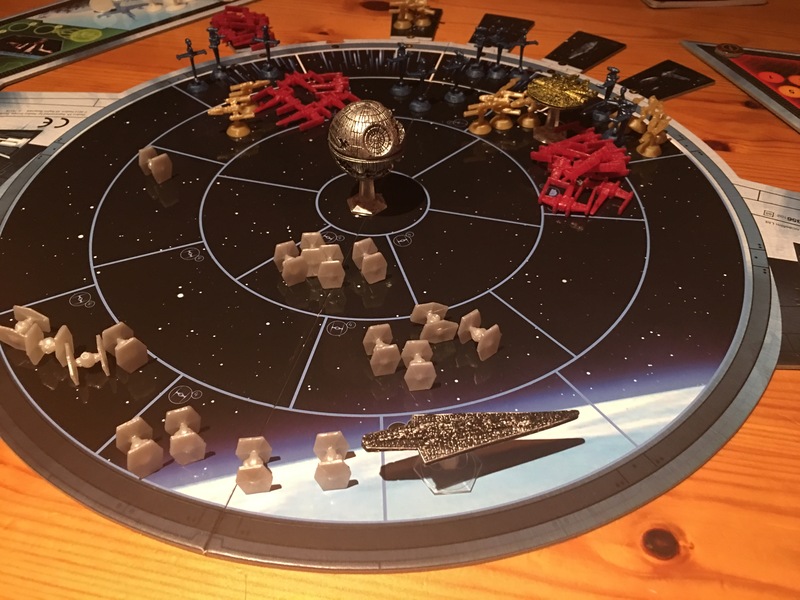 The game kicks off with the rebel fleet arriving to find a shielded and fully operational DeathStar in the center of the map, a swarm of tie fighters and the really nasty executioner launching more. Each turn both players pick three action cards from their hand of six and alternatively play one after another. The cards allow you to influence the three sections of the map. Cards allow you to advance along the Endor track or in the case of the empire send out storm troopers to slow the rebels down. Other cards allow you to inflict damage on Luke or Vader and lead to their defeat. The real fun is in the center where the big space battle is taking place. 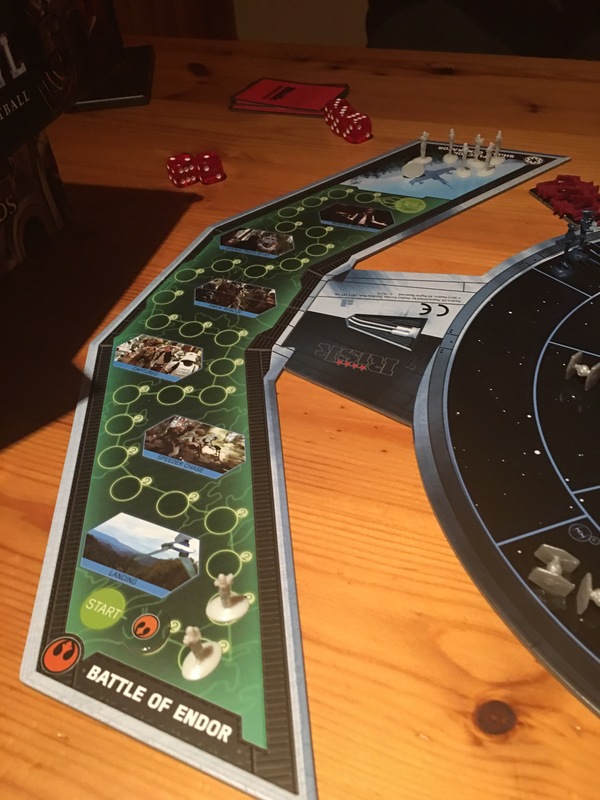 Cards allow you to move and attack with your ships (x-wings, y-wings, b-wings and the falcon) or in the case of the Empire launch, move, attack with tie fighters and fire the DeathStar laser. The game is pretty much a two player but it can be played as a team (haven’t tried). It’s a lot of fun. It’s fast. An hour plus will get it played. It’s tense with a lot of on the fly decisions and strategy changes needed. It’s well produced, the models are good enough but we’ve come to expect a lot thanks to Fantasy Flight games. One glaring oddity is a gold painted falcon model which literally makes it stick out like a whore at a wake. Outside of that it’s nicely done. It’s a great game for kids it works well for bigger kids too and it’s all strongly Star Wars themed from start to finish. This is a solid fun game. It’s not the best board game ever made but it’s certainly the best Risk game I’ve come across and I’m eager to play it again.